Behold the most precious member of the Talking Vice Presidential Candidate Doll® collection! This Amtrak-riding senator is a real handful, from threatening his own running mate about gun control issues, to admitting Hillary Clinton would have made a better vice presidential candidate, to displaying an embarrassing lack of knowledge about the Franklin D. Roosevelt years. He sticks his foot in his mouth over and over again! "A man I'm proud to call my friend. A man who will be the next President of the United States — Barack America !" Experience an astounding level of cringe-worthy gaffes with this Talking Vice Presidential Candidate® Doll! Available exclusively from the U.S. Department of Toys and Doll Services, the lifelike Joe doll is a remarkable addition to the collection, which also includes the adorable Obama, McCain and Palin talking dolls. Joe arrives in a blue suit, and even comes with FREE hair plugs, Botox needle and extra veneers. Don't wait, strong demand for this loose cannon is expected -- order now! Medium: ink on paper, digital color. Concept created by GOTA and Holy Candy. Text and post written by Candy Kirby. Political Miracles™ Lifelike Beauty Queen-Turned-Vice Presidential Candidate Doll only: $59.99 With change of clothes: $150,059.99 This Talking Vice Presidential Candidate Doll™ is truly a political miracle! 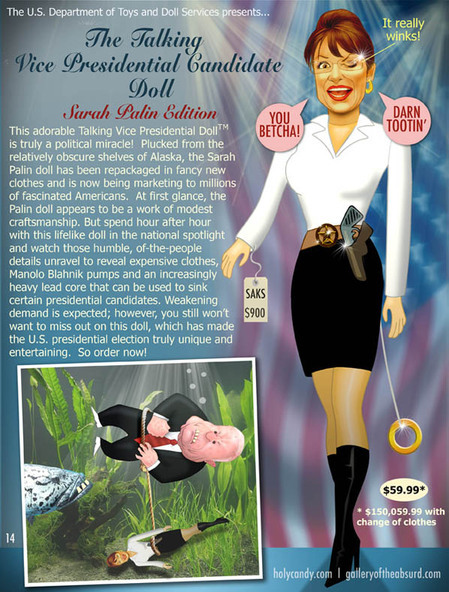 Plucked from the relatively obscure shelves of Alaska , the Sarah Palin doll has been repackaged in fancy new clothes and is now being marketed to millions of fascinated Americans. Snuggling comfortably in the palm of hard-core conservatives, she looks like a relatable hockey mom. Be prepared to be endeared by this self-proclaimed down-to-earth moose hunter; when you pull her string, she will distract you from her lack of knowledge with confident winks and chirps of “you betcha,” “darn tootin’,” “doggonit” and “let me talk about energy policy instead…” At first glance, the Palin doll appears to be a work of modest craftsmanship. But spend hour after hour with this lifelike doll in the national spotlight and watch those humble, of-the-people details unravel to reveal expensive Kawasaki frames, Manolo Blahnik pumps and an increasingly heavy lead core that can be used to sink certain presidential candidates. Available exclusively from the U.S. Department of Toys and Doll Services, this beautiful, lifelike Talking Vice Presidential Candidate Doll arrives with a FREE gun and drill – the perfect accessory for an Alaskan governor who resolutely supports drilling for oil in the pristine Arctic National Wildlife Refuge. Weakening demand is expected; however, you still won’t want to miss out on this doll, which has made the U.S. presidential election truly unique and entertaining. So order now! Joe Biden Doll being offered soon. Medium: ink on paper, digital color. Concept created by GOTA and Holy Candy. Text and post written by Candy Kirby. 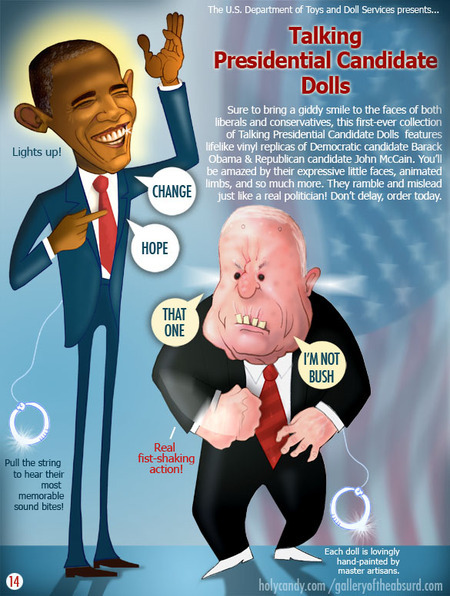 Get Your Barack Obama and John McCain Talking Dolls Today! "If you make $250,000 a year or less..."
"The fundamentals of our economy are strong!" "I know how to fix the entire world!" Handcrafted by master artisans and available exclusively from the U.S. Department of Toys and Doll Services, each of the collectible dolls in this Talking Presidential Candidate® collection is more appealing than the puppet currently in the White House. Don't delay! Intense demand is expected for these little charmers, so order now. Medium: ink on paper, digital color. Concept created by GOTA and Holy Candy. Text and post written by Candy Kirby. 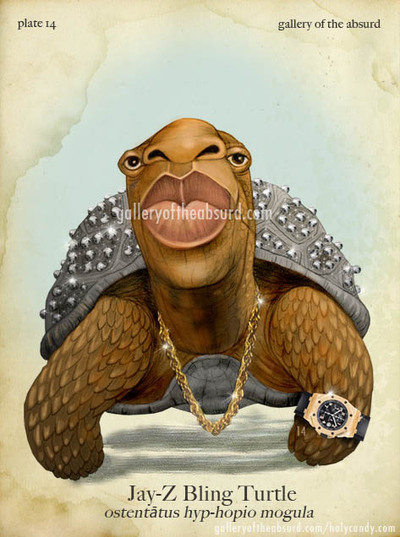 The Bling Turtle is an obscenely wealthy reptile of the Species Ostentātus hyp-hopio mogula, whose soft body is shielded by a diamond-encrusted shell. Unlike other reptiles, Bling Turtles travel by white Escalade and private yacht, and live primarily on cases of perfectly chilled Armand de Brignac. They will withdraw their head into their shells when asked whether they are, in fact, married to their longtime girlfriend; however, they are also known to become aggressive when provoked by fellow hyp-hopio artists – which rap zoologists have identified as “Nas” – with “oh no, he didn’t”-type lyrics dismissing Bling Turtle as serious competition. The Bling Turtle is indigenous to New York City, and can be found overseeing his many business ventures; piling on yet more bling; supporting the Yankees with a perpetually crooked baseball cap; sailing to the South of France; delivering clean water to Africa; and retiring from music-making – and repeatedly triumphantly returning to music-making. Medium: graphite, ink on paper, digital color and bling. Idea of Bling Turtle came to me after Candy Kirby suggested Jay-Z might resemble a turtle. Latin name and description written by Candy Kirby. 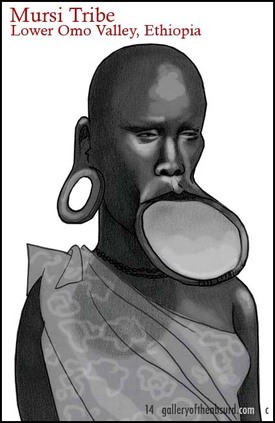 As excessive cosmetic surgery procedures become more widespread among certain self-absorbed inhabitants of Beverly Hills, London and beyond, research scientists specializing in cross cultural body modification have begun to take notice. 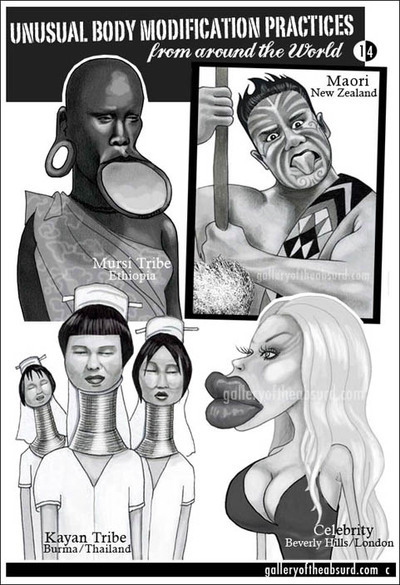 For centuries, people have marveled over the unusual variations of body modification in the name of beauty and cultural identification -- the lip plates of the Mursi Tribe in Ethiopia, the facial tattoos of Tribal New Zealand's Maori, the elongated necks of the mountain-dwelling Kayan Tribe, and the most bizarre of them all, the Celebrity people of the Entertainment Industry. 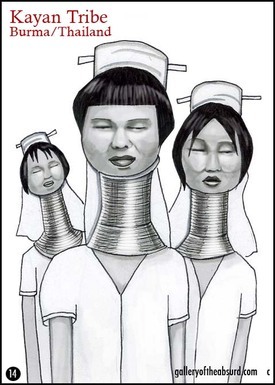 Identified by their over-inflated lips, melon-sized chest implants, taut immovable facial skin, cheek implants, eyebrows nearly touching their scalps, hair extensions, and often skeletal frame, they can be spotted with great regularity in habitats such as tony boutiques and cafe hot spots. 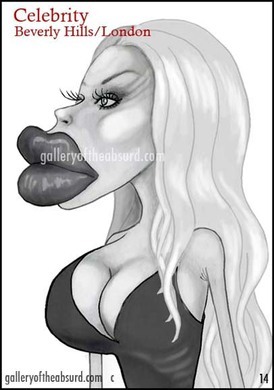 Scientists theorize this bizarre conception of beauty is a result of the desperate quest to regain the dwindling blossom of youth even though the Celebrity often becomes more appalling than alluring. 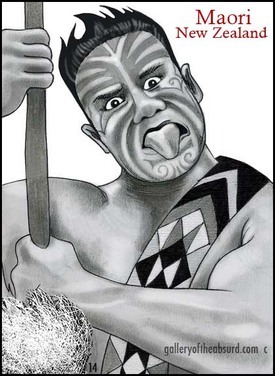 Further study is needed to understand this shocking high strangeness. Medium: ink, liquid pencil, on paper, digital color.